Comcast (s CMCSA), the corporate parent of tape-delay network NBC, lost 176,000 basic video subscribers during the second quarter of 2012, but saw 156,000 net new additions to its broadband subscriber base, which now stands at 18.74 million subscribers. During the same quarter in 2011, Comcast added 144,000 broadband subscribers but lost 238,000 video customers. Comcast’s growth in broadband subscriptions is in direct contrast with the Baby Bells who are continuing to bleed DSL customers, driving them into the arms of cable companies. Comcast is losing video subscribers to competitors such as satellite and phone companies. It is also grappling with a broader demographic shift that is prompting cord cutting. Nearly 9.7 million households also buy their phone service from Comcast these days. 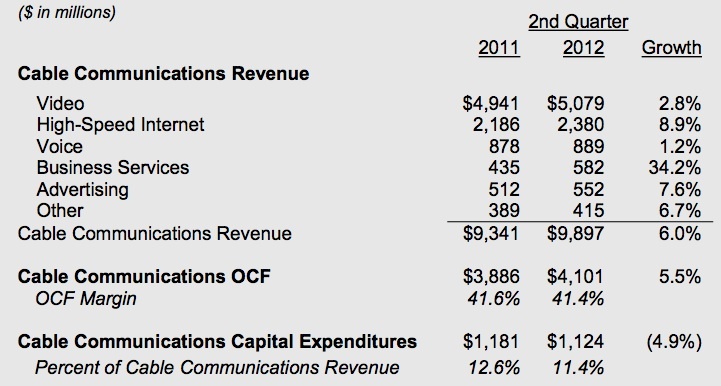 For Q2 2012, Comcast posted revenues of $15.21 billion, $3.08 billion in operating income, and 50 cents in earnings per share. The video business brought in $5.08 billion for the company while broadband business brought in $2.4 billion in revenues during the quarter. I’d be very glad to be in Comcast’s predicament. Margins for broadband are fat, video margins not so much. Comcast will be exceedingly successful while increasing profits if they operate as nothing more than a ‘courier of bits’.